This week the renovation of the “old dorm” continued with some preliminary excavations to expose and then seal the foundations and lower walls which were allowing seepage into the basement. 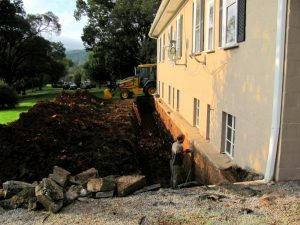 This important second phase of the renovation project will include installing more effective drainage for the rain run-off from the various roofs—run-off that has been part of the seepage problem. Although actual plans for the interior renovation have not been finalized, it is hoped that they will include handicap access. This will then also allow handicap access to the chapel, via the “old dorm,” and through the Chapter Room.